Renegade Concepts, makers of quality-engineered digital lifestyle accessories, has launched its comprehensive line of soft and supportive tablet, eReader and book workstation stands. The LAP PRO Classic, LAP PRO MINI and child-friendly MOBIMATES maintain the confident charm and coziness of Renegade’s original offerings while adding new selections to fit your full family of electronic devices at home or on the go. Renegade’s flagship brand, the LAP PRO Classic is a natural match for all digital tablet devices and nearly any hard or soft-covered reading material. Its gentle polyester microfiber build boasts a wide range of adjustable viewing angles and color schemes. 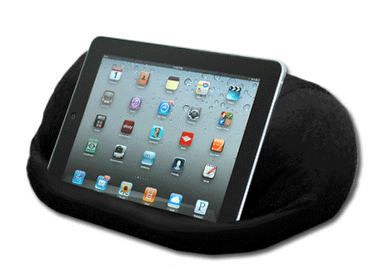 It can also work as a travel pillow or tote bag, thanks to its convenient zipper compartment. Featuring all the utility and support of the Classic, the lighter, compact form of the new LAP PRO MINI combines practicality and portability, making it easy to take anywhere and ideal for protecting smaller electronic devices and paperbacks. Finally, Renegade is proud to introduce the MOBIMATES , a new pack of adorable stuffed animal toys for children and young adults that double as tablet stands. Like the LAP PRO, these plush companions are made without hard or sharp parts, and can be adjusted to fit any tablet and most books comfortably while reclined or on most uneven surfaces. Available as either a brown bear or white polar bear, each MOBIMATE is designed for fun and function, fine-stitched for durability and resilience over extended play or reading. Renegade’s complete catalogue of LAP PRO and MOBIMATE accessories can be found at Amazon. For more information on Renegade and its product library, visit www.MyLapPro.com and www.MyMobimates.com.